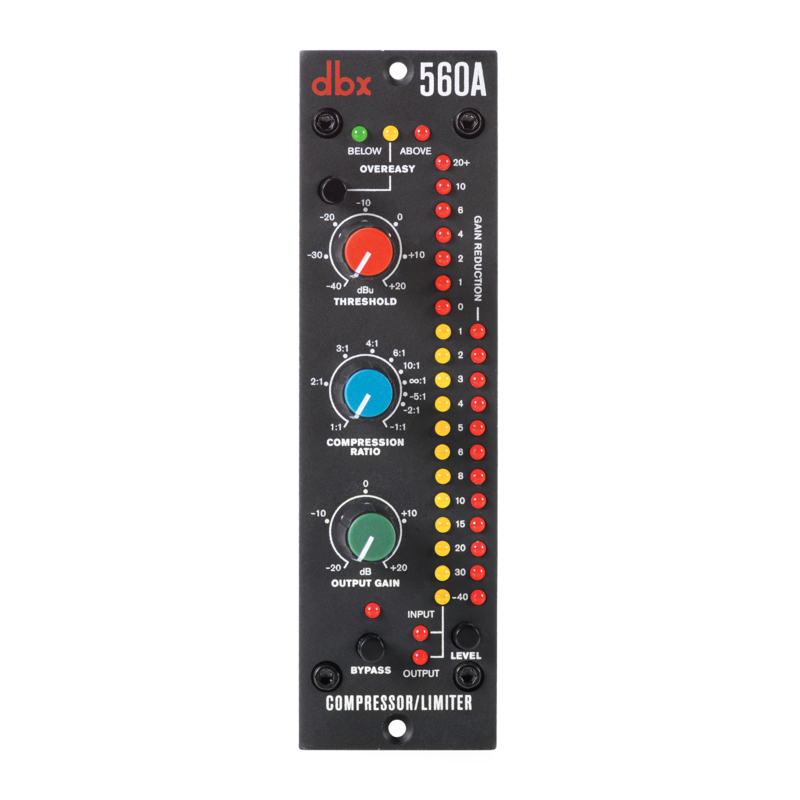 The dbx 560A Compressor/Limiter offers legendary VCA-based compression in the increasingly popular 500 Series format. dbx has a much-heralded history with modular processors dating back to our 900 Series and the 560A continues that tradition. Featuring the same switch-selectable OverEasy® and Hard Knee compression curves as our industry-standard dbx 160A rackmount processor, the dbx 560A will be your new workhorse compressor! With extremely wide-ranging threshold, ratio and output controls and true RMS level detection providing the most natural-sounding dynamics processing available, the 560A will provide punch to drums, bass, vocals, almost anything! It’s also versatile enough to go from subtle compression to "brick wall" peak limiting. Choose low ratios and OverEasy compression to expertly smooth out fluctuating vocal and instrumental levels, or use the 560A's Hard Knee compression and high ratios for bombproof protection against overload distortion in digital recording, P.A. systems and broadcast signals. The 560A's 19-segment, switchable Input/Output LEDs and 12-segment Gain Reduction LEDs provide precise analysis at a glance. And, the dbx 560A's unique "INFINITY +" inverse-compression mode actually decreases the audio output level below unity gain when the input exceeds threshold, a real lifesaver for correcting overbearing vocal choruses and controlling runaway mix levels. 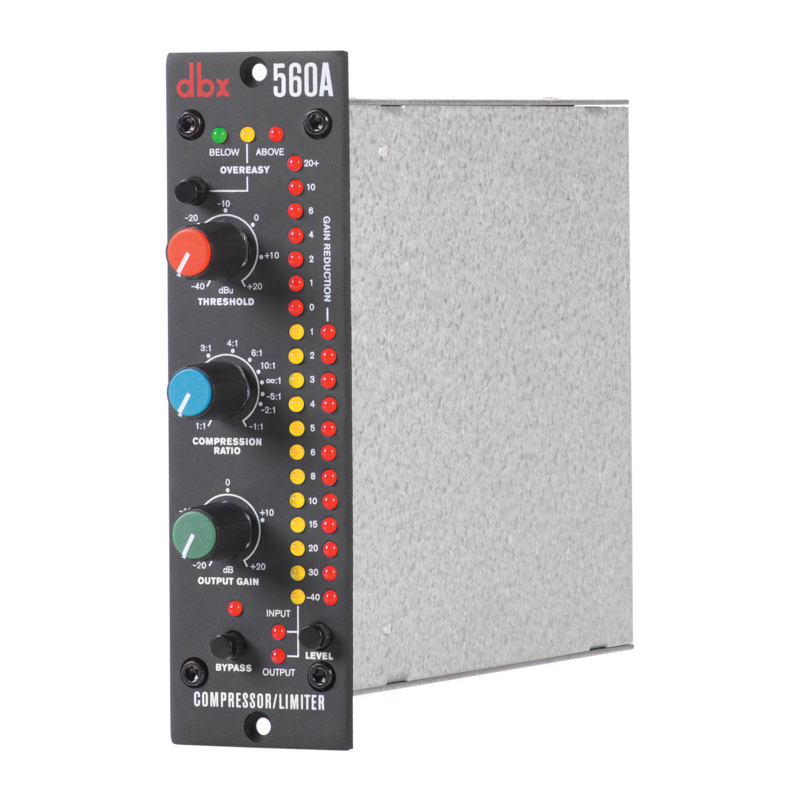 Load up your 500 Series rack with some dbx 560A Compressor/Limiters and go to work!